THIS POST WAS ORIGINALLY WRITTEN ON OCTOBER 4TH, 24 HOURS AFTER AMAZON’S TOS UPDATE. WE HAVE SINCE UPDATED AS OF OCTOBER 24, 2016 AFTER MANY EMAIL CONVERSATIONS WITH AMAZON LEGAL…EACH AREA BELOW IS HIGHLIGHTED WITH OUR UPDATED INFORMATION. On Oct 3, Amazon released this update to the Terms of Service. Specifically, Amazon sellers can no longer give a discounted or free product to anyone in exchange for a review, honest or otherwise. Why we think Amazon made this change. As you know, at iLoveToReview, we have always designed our service offerings around Amazon’s TOS. Unfortunately, not all sellers or review companies have done the same and it’s caused Amazon to take a sweeping action to protect the integrity of their review system. In essence, we totally agree with Amazon’s intention here. Reviews should be unbiased. What are we telling our members? Per Amazon’s new TOS, we are informing members that as of today they are no longer obligated to leave a review in exchange for a product they receive for free or at a discount from our clients. That being said, members of this community actually love writing reviews and we believe that most will continue to do so. We are pausing campaigns for the next 48 hours while we update our website and our member community is receiving this communication. iLoveToReview has ceased all operations within the Amazon marketplace. There is no simple way to continue under the new TOS. Our company name is now inherently against Amazon policy. We have launched a new suite of services for Amazon sellers that are currently only available to our current clients. We will make those available to the public soon and will update this post again. Why most sellers are proceeding with their campaigns. When launching products in any market (online or not), the practice of giving away or discounting products is common and companies will continue to do it. Even without the review component, discounted sales and promotions on Amazon will continue to be a key strategy to increase sales velocity, improve ranking and make full-priced sales. This hasn’t changed. These are some of the new services which will be available soon. What about past reviews that were gained through promotions? If your campaign has already run, according to Amazon (via TechCrunch), those reviews should stick. Here’s an excerpt from the TechCrunch article. 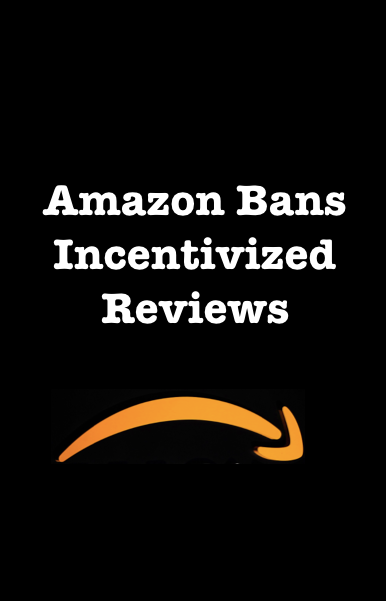 While Amazon stately publicly above that they don’t plan to wipe ‘incentivized reviews,’ many sellers have already seen lots of reviews disappear and it’s rumored that Amazon plans to remove most of them. Campaigns will continue to run to drive the sales velocity you need as a seller and our members will always have the ability to leave a review on a product should they choose. The only difference is that reviewers are no longer obligated to leave a review. We are crystal clear about this in every communication we have with our members. No campaigns will run through iLoveToReview. The new company’s services and website have no mention of reviews anywhere. Services should be available to the general public by November 1. - " + message + "
Amazon Ends Incentivized Reviews. Sellers Seek New Opportunities. On October 3, 2016 Amazon made it against their Terms of Service to offer discounted products in exchange for reviews. Amazon sellers everywhere immediately began searching for alternative methods of promoting their products to gain visibility. Savvy sellers have found a way to stay within Terms of Service, beat the competition, and grow their businesses despite the update.